New feature of ISTpro: Use it on your own computer. 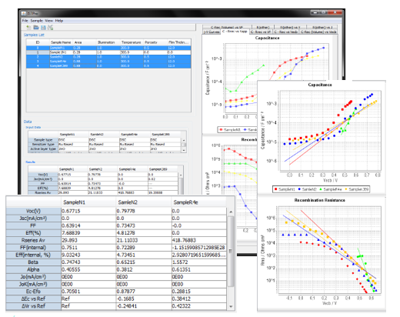 ISTpro program is a popular online tool for treating impedance spectroscopy data of dye-sensitized solar cells. 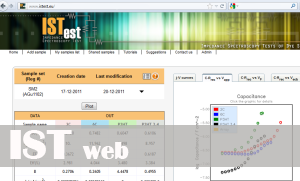 ISTpro allows you to evaluate the performance of a set of DSC by analysis of chemical capacitance and recombination resistance plots vs. voltage, and to visualize additional features such as the internal voltage and efficiency, using the standard analysis protocols developed by Bisquert, Fabregat-Santiago and co., that have become universally adopted. Now ISTPro runs in your computer. Please download the desktop application and evaluate the use. If you do frequent analysis of DSCs you will find this tool invaluable for analysis and publication of your results. We build and implement custom and packaged IT solutions that meet the demand of highly competitive companies or labs like yours. ISTest provides tools that enhance research productivity. ISTest offers solutions for academic labs and industries. Our technical team is responsible for checking their needs and offer the best alternatives. We will attend to answer any questions you may have about maintenance, functionality, etc..